Coal, a black, brittle, sedimentary rock that burns, consists of elemental carbon mixed with minor amounts of organic chemicals, quartz, and clay. Typically, the carbon atoms in coal have bonded to form complicated molecules. Note that coal and oil do not have the same composition or origin. In contrast to oil, coal forms from plant material (wood, stems, leaves) that once grew in coal swamps, regions that resembled the wetlands and rain forests of modern tropical to semitropical coastal areas. Like oil and gas, coal is a fossil fuel because it stores solar energy that reached Earth long ago. Signiﬁcant coal deposits could not form until vascular land plants appeared in the late Silurian Period, about 420 million years ago. The most extensive deposits of coal in the world occur in Carboniferous-age strata (deposited between 286 and 354 million years ago). During the Carboniferous, the continents were assembled in Pangaea, and large areas straddled warm tropical regions where vegetation ﬂourished. Also during this time, sea level was so high that large areas of continents were ﬂooded by shallow seas along which vast swamps grew; the plant debris of these swamps, once buried and heated, turned into coal. 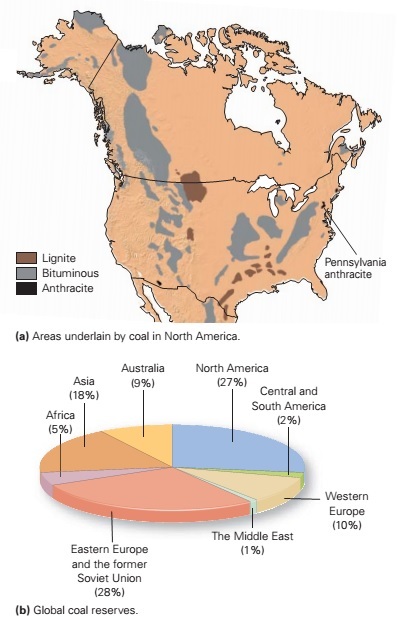 Not all coal reserves, however, are Carboniferous during the Cretaceous (144 to 65 Ma), large areas of freshwater coal swamps developed in Wyoming and adjacent states. Coal commonly occurs in beds, or seams, that may be centimetres to meters thick and may be traceable over very large regions. Broad, continuous coal seams develop when sea level rises slowly relative to the land surface so the coastline, and therefore the coal swamp, migrates slowly inland. During such a transgression, the submerged portion of the coal swamp eventually gets buried by layers of other sediments, such as sand and mud. When lithiﬁed, the succession turns into beds of sedimentary rock, with the coal occurring as a sedimentary bed, inter-layered with sandstone and shale. The formation of coal. Coal forms when plant debris becomes deeply buried. How do the remains of plants transform into coal? The vegetation of an ancient swamp must fall and be buried in an oxygen-poor environment, such as stagnant water, so that it can be incorporated in a sedimentary sequence without ﬁrst decaying by reacting with oxygen and/or by being eaten by microbes or larger organisms. Compaction and partial decay of the vegetation transforms it into peat. (Peat, which contains about 50% carbon, itself serves as a fuel in many parts of the world.) To transform peat into coal, the peat must be buried deeply (4–10 km) by overlying sediment. Such deep burial can happen where the surface of the continent gradually sinks, creating a depression, or sedimentary basin, that can collect sediment. Over time, many kilometers of sediment containing numerous peat layers accumulate. At depth in the pile, the weight of overlying sediment compacts the peat and squeezes out any remaining water. Then, because temperature increases with depth in the Earth, deeply buried peat gradually heats up. Heat accelerates chemical reactions that gradually destroy plant ﬁber and release elements such as hydrogen, nitrogen, and sulfur in the form of gas. These gases seep out of the reacting peat layer, leaving behind a residue concentrated with carbon. Once the proportion of carbon in the residue exceeds about 50%, the deposit formally becomes coal. With further burial and higher temperatures, chemical reactions allow additional hydrogen, nitrogen, and sulfur to escape, yielding progressively higher concentrations of carbon. 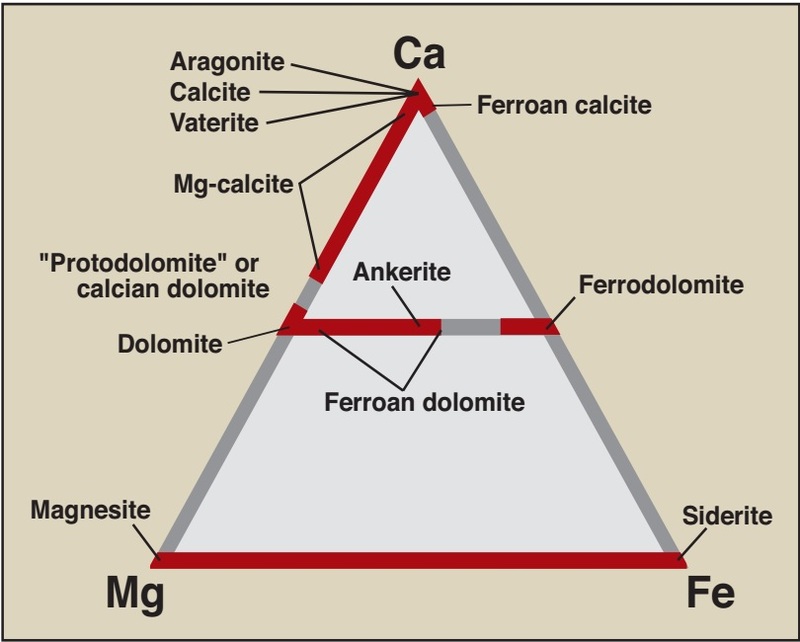 Geologists classify coal according to the concentration of carbon. With increasing burial, peat transforms into a soft, dark-brown coal called lignite. At higher temperatures (about 100n–200nC), lignite, in turn, becomes dull, black bituminous coal. At still higher temperatures (about 200n–300nC), bituminous coal transforms into shiny, black anthracite coal (also called hard coal). The progressive transformation of peat to anthracite coal, which occurs as the coal layer is buried more deeply and becomes warmer, reﬂects the completeness of chemical reactions that remove water, hydrogen, nitrogen, and sulfur from the organic chemicals of the peat and leave behind carbon (Fig. 12.6c). 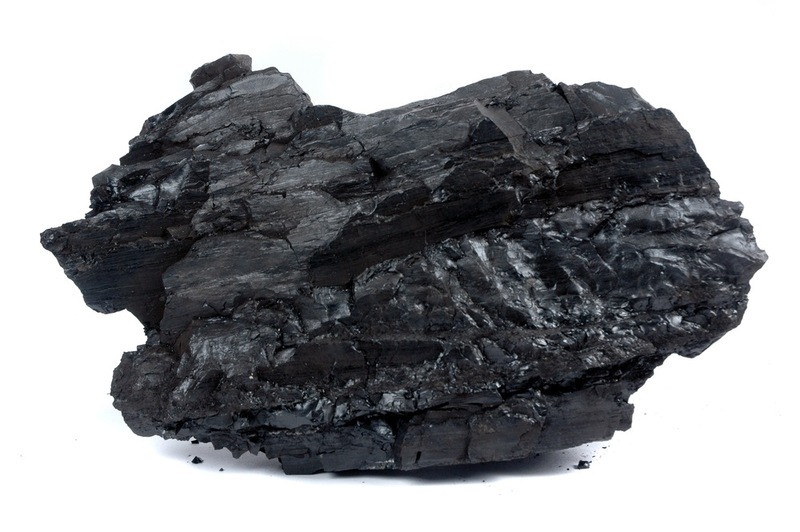 Thus, lignite contains only about 50% carbon, bituminous about 70%, and anthracite about 90%. As the carbon content of coal increases, we say the coal rank increases. Notably, the formation of anthracite coal requires high temperatures that develop only on the borders of mountain belts, where mountain-building processes can push thick sheets of rock up along thrust faults and over the coal-bearing sediment, so the sediment ends up at depths of 8 to 10 km, where temperatures reach 300nC. Hot groundwater ﬂowing through the rock may also provide enough heat to produce anthracite. The distribution of coal reserves. 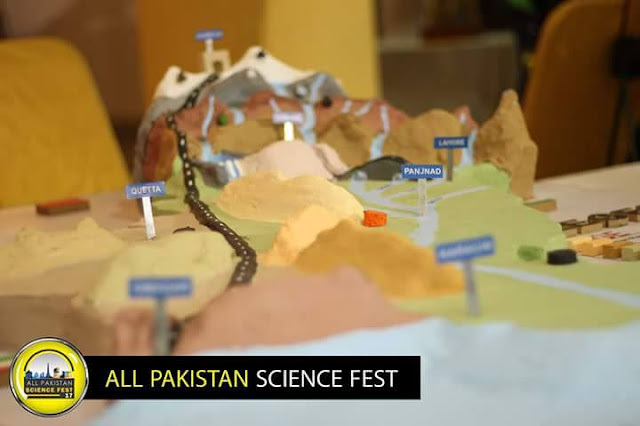 Vast quantities lie buried in continental sedimentary basins. Because the vegetation that eventually becomes coal was initially deposited in a sequence of sediment, coal seams interlayered with other sedimentary rocks. To ﬁnd coal, geologists search for sequences of strata that were deposited in tropical to semitropical, shallow-marine to terrestrial environments the environments in which a swamp could exist. 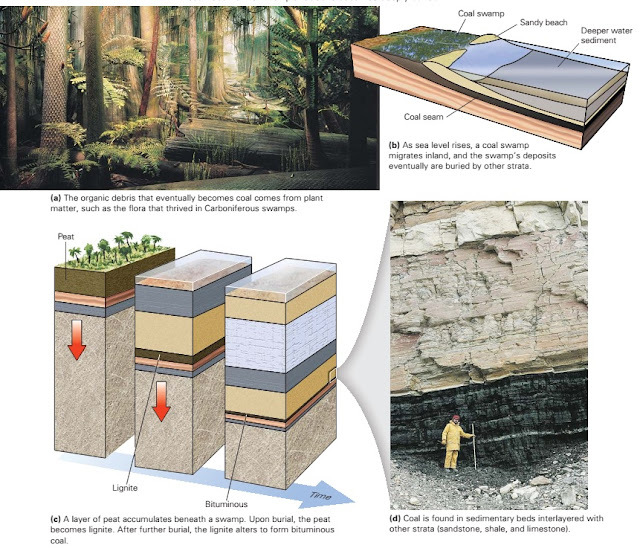 The sedimentary strata of continents contain huge quantities of discovered coal, or coal reserves. The way in which companies mine coal depends on the depth of the coal seam. If the coal seam lies within about 100 m of the ground surface, strip mining proves to be the most economical method. In strip mines, miners use a giant shovel called a dragline to scrape off soil and layers of sedimentary rock above the coal seam. Draglines are so big that the shovel could swallow a two-car garage without a trace. Once the dragline has exposed the seam, miners use smaller power shovels to dig out the coal and dump it into trucks or onto a conveyor belt. Before modern environmental awareness took hold, strip mining left huge scars on the landscape. Without topsoil, the rubble and exposed rock of the mining operation remained barren of vegetation. In many contemporary mines, however, the dragline operator separates out and preserves soil. Then, when the coal has been scraped out, the operator ﬁlls the hole with the rock that had been stripped to expose the coal and covers the rock back up with the saved soil, on which grass or trees may eventually grow. In hilly areas, however, miners may use a practice called mountain top removal, during which they blast off the top of the mountain and dump the debris into adjacent valleys. This practice can disrupt the landscape permanently. Deep coal can be obtained only by underground mining. To develop an underground mine, miners dig a shaft down to the depth of the coal seam and then create a maze of tunnels, using huge grinding machines that chew their way into the coal. Underground coal mining can be very dangerous, not only because the sedimentary rocks forming the roof of the mine are weak and can collapse but also because methane gas released by chemical reactions in coal can accumulate in the mine, leading to the danger of a small spark triggering a deadly mine explosion. Unless they breathe through ﬁlters, underground miners also risk contracting black lung disease from the inhalation of coal dust. Coalbed Methane As we’ve noted, the natural process by which coal forms underground yields methane, a type of natural gas. Over time, some of the gas escapes to the atmosphere, but vast amounts remain within the coal in pores or bonded to coal molecules. Such coalbed methane, trapped in strata too deep to be reached by mining, is an energy resource that has become a target for exploration in many regions of the world. Obtaining coalbed methane from deep layers of strata involves drilling, rather than mining. Drillers penetrate a coalbed with a hole and then start pumping out groundwater. As a result of pumping out water, the pressure in the vicinity of the drill hole decreases relative to the surrounding bed. Methane bubbles into the hole and then up to the ground surface, where condensers compress it into tanks for storage. Coal Gasiﬁcation Solid coal can be transformed into various gases, as well as solid by-products, before burning. The process of producing relatively clean-burning gases from solid coal is called coal gasiﬁcation. Coal gasiﬁcation involves the following steps. First, pulverized coal is placed in a large container. Then, a mixture of steam and oxygen passes through the coal at high pressure. As a result, the coal heats up to a high temperature but does not ignite; under these conditions, chemical reactions break down and oxidise the molecules in coal to produce ﬂammable gases as well as water and CO2. Solid ash, as well as sulphur and mercury, concentrate at the bottom of the container and can be removed before the gases are burned. Coal will burn not only in furnaces but also in surface and subsurface mines, as long as the ﬁre has access to oxygen. Coal mining of the past two centuries has exposed much more coal to the air and has provided many more opportunities for ﬁres to begin; once started, a coalbed ﬁre that progresses underground (sucking in oxygen from joints in overlying rock) may be very difﬁcult or impossible to extinguish. For the past 50 years, a coalbed ﬁre has progressed under the town of Centralia, Pennsylvania, eventually burning coal seams beneath the town itself. The ﬁre produces toxic fumes that rise through the ground and make the overlying landscape uninhabitable, and it also causes the land surface to collapse and sink. And today, over 100 major coalbed ﬁres are burning in northern China. Recent estimates suggest that 200 million tons of coal burn underground in China every year, an amount equal to approximately 20% of the annual national production of coal in China. Oil that can be extracted from reserves in the porous and permeable reservoir rocks of oil traps. Such reserves have come to be known as conventional reserves, because accessing them uses technology that has been around for years. In the past 10 to 15 years, energy companies have begun to increase their focus on extracting hydrocarbons from unconventional reserves, meaning reserves that had previously been left in the ground or disposed of because they cannot be tapped without using new technologies. Let’s look at a few examples of these reserves. Natural gas consists of volatile, short-chain hydrocarbon molecules (methane, ethane, propane, and butane). Gas burns more cleanly than oil, in that combustion of gas produces only CO2 and water, while the burning of oil not only produces CO2 and water, but also complex organic pollutants. Thus, natural gas has become the preferred fuel for home cooking and heating, and in some localities, for electricity production. It can also be used to run cars and trucks, if the vehicles have been appropriately modiﬁed. Natural gas has not yet been used as widely as other hydrocarbons, because gas transportation, which requires high-pressure pipelines or special ships, is quite expensive. But its use is increasing rapidly. As we have seen, gas often occurs in association with oil. Unfortunately, at many oil wells, it is not economical to capture and transport the gas, so this gas vents from a pipe and is burned in a ﬂare where it enters the air. (In localities where rock has been heated to temperatures higher than the oil window, reservoir rock may contain only gas and there may be enough to be worth pumping and capturing by conventional means.) Recently, the use of directional drilling and hydraulic fracturing has made it possible to extract large quantities of gas directly from source rocks. Large reserves of such shale gas underlie states in the northeastern United States, and are currently being drilled to provide energy for east-coast cities (Box 12.2). Intense exploration for shale gas reserves has begun worldwide. So far, we’ve focused our discussion on hydrocarbon reserves that can be pumped from the subsurface in the form of a liquid or gas. But in several locations around the world, most notably Alberta (in western Canada) and Venezuela, vast reserves of very viscous, tar-like “heavy oil” exist. This heavy oil, known also as bitumen, has the consistency of gooey molasses, and thus cannot be pumped directly from the ground. It ﬁlls the pore spaces of sand or of poorly cemented sandstone, constituting up to 12% of the sediment or rock volume. Sand or sandstone containing such high concentrations of bitumen is known as tar sand or oil sand. Production of usable oil from tar sand is difﬁcult and expensive, but not impossible. It takes about 2 tons of tar sand to produce one barrel of oil. Oil companies mine near-surface deposits in vast open-pit mines and then heat the tar sand in a furnace to extract the oil. Producers then crack the heavy oil molecules to produce smaller, more usable molecules. Trucks dump the drained sand back into the mine pit. To extract oil from deeper deposits of tar sand, oil companies drill wells and pump steam or solvents down into the sand to liquefy the oil enough so that it can be pumped out. 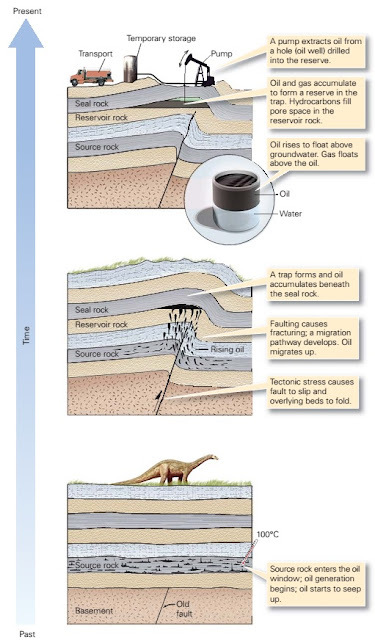 Vast reserves of organic shale have not been subjected to temperatures of the oil window, or if they were, they did not stay within the oil window long enough to complete the transformation to oil. Such rock still contains a high proportion of kerogen. 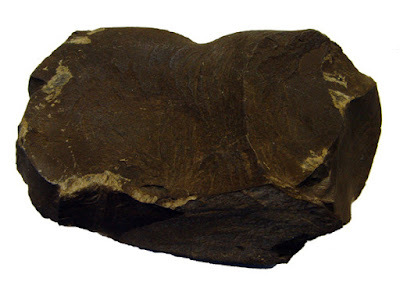 Shale that contains at least 15% to 30% kerogen is called oil shale. Lumps of oil shale can be burned directly and thus have been used as a fuel since ancient times. In general, however, energy companies produce liquid oil from oil shale. The process involves heating the oil shale to a temperature of 500nC; at this temperature, the shale decomposes and the kerogen transforms into liquid hydrocarbon and gas. As is the case with tar sand, production of oil from oil shale is possible, but very expensive. In the United States, during the ﬁrst half of the 19th century, people collected “rock oil” (later called petroleum, from the Latin words petra, meaning rock, and oleum, meaning oil) at seeps and used it to grease wagon axles and to make patent medicines. But such oil was rare and expensive. In 1854, George Bissel, a New York lawyer, came to the realization that oil might have broader uses, particularly as fuel for lamps, to replace increasingly scarce whale oil. Bissel and a group of investors contracted Edwin Drake, a colourful character who had drifted among many professions, to ﬁnd a way to drill for oil in rocks beneath a hill near Titusville, Pennsylvania, where oily ﬁlms ﬂoated on the water of springs. Using the phony title “Colonel” to add respectability, Drake hired drillers and obtained a steam-powered drill. Work was slow and the investors became discouraged, but the very day that a letter arrived ordering Drake to stop drilling, his drillers found that the hole, which had reached a depth of 21.2 m, had ﬁlled with oil. They set up a pump, and on August 27, 1859, for the ﬁrst time in history, pumped oil out of the ground. No one had given much thought to the question of how to store the oil, so workers dumped it into empty whisky barrels. This ﬁrst oil well yielded 10 to 35 barrels a day, which sold for about $20 a barrel (1 barrel equals 42 gallons). Within a few years, thousands of oil wells had been drilled in many states, and by the turn of the 20th century, civilization had begun its addiction to oil. Initially, most oil went into the production of kerosene for lamps. Later, when electricity took over from kerosene as the primary source for illumination, gasoline derived from oil became the fuel of choice for the newly invented automobile. Oil was also used to fuel electric power plants. In its early years, the oil industry was in perpetual chaos. When “wildcatters” discovered a new oil ﬁeld, there would be a short-lived boom during which the price of oil could drop to pennies a barrel. In the midst of this chaos, John D. Rockefeller established the Standard Oil Company, which monopolized the production, transport, and marketing of oil. In 1911, the Supreme Court broke down Standard Oil into several companies including Exxon (Esso), Chevron, Mobil, Sohio, Amoco, Arco, Conoco, and Marathon some of which have recombined in recent decades. Oil became a global industry governed by the complex interplay of politics, proﬁts, supply, and demand. Wildcatters discovered the earliest oil ﬁelds either by blind luck or by searching for surface seeps. But in the 20th century, when most known seeps had been drilled and blind luck became too risky, oil companies realized that ﬁnding new oil ﬁelds would require systematic exploration. The modern-day search for oil is a complex, sometimes dangerous, and often exciting procedure with many steps. Source rocks are always sedimentary, as are most reservoir and seal rocks, so geologists begin their exploration by looking for a region containing appropriate sedimentary rocks. Then they compile a geologic map of the area, showing the distribution of rock units. 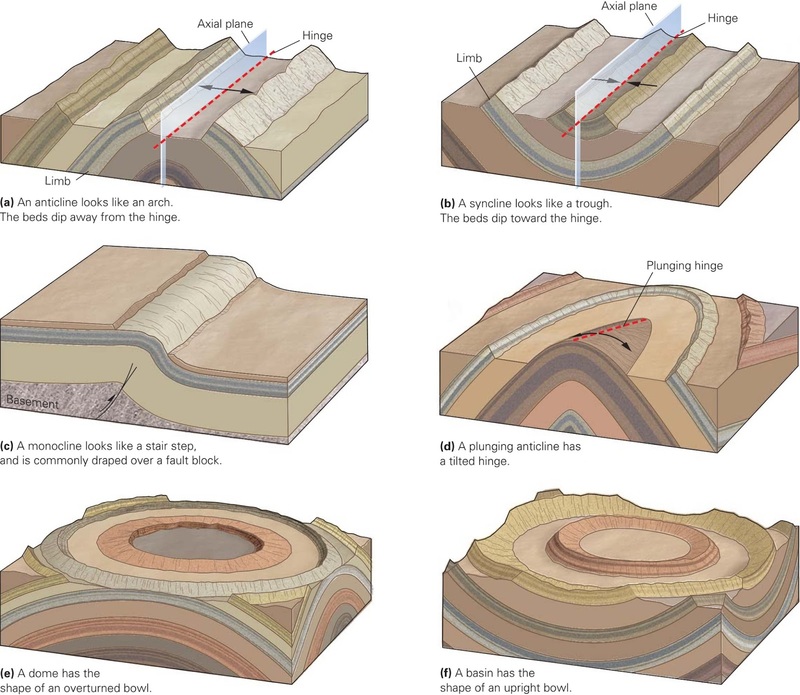 From this information, it may be possible to construct a preliminary cross section depicting the geometry of the sedimentary layers underground as they would appear on an imaginary vertical slice through the Earth. To add detail to the cross section, an exploration company makes a seismic-reﬂection proﬁle of the region. 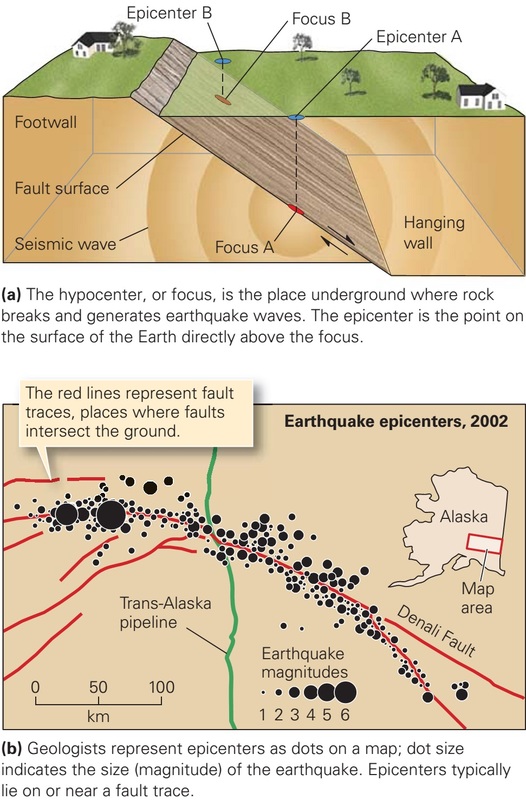 To obtain a seismic proﬁle, a special vibrating truck or a dynamite explosion sends seismic waves (shock waves that move through the Earth) into the ground. The seismic waves reﬂect off contacts between rock layers, just as sonar waves sent out by a submarine reﬂect off the bottom of the sea. Reﬂected seismic waves then return to the ground surface, where sensitive instruments (geophones) record their arrival. A computer measures the time between the generation of a seismic wave and its return, and from this information deﬁnes the depth to the contacts at which the wave reﬂected. With such information, the computer constructs an image of the conﬁguration of underground rock layers and, in some cases, can “see” reserves of oil or gas. If geological studies identify a trap, and if the geologic history of the region indicates the presence of good source rocks and reservoir rocks, geologists make a recommendation to drill. (They do not make such recommendations lightly, as drilling a deep well may cost over $50 million.) Once the decision has been made, drillers go to work. 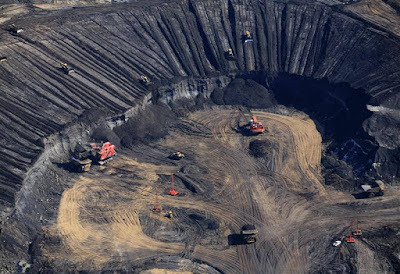 These days, drillers use rotary drills to grind a hole down through rock. A rotary drill consists of a pipe tipped by a rotating bit, which is a bulb of metal studded with hard metal prongs. As the bit rotates, it scratches and gouges the rock, turning it into powder and chips. Drillers pump “drilling mud,” a slurry of water mixed with clay and other materials, down the center of the pipe. The mud ﬂows down, past a propeller that rotates the drill bit, and then squirts out of holes at the end of the bit. The extruded mud cools the bit head, which otherwise would heat up due to friction as it grinds against rock, then ﬂows up the hole on the outside of the drill pipe. As it rises, the mud carries “rock cuttings” (fragments of rock that had been broken up by the drill bit) up and out of the hole. Mud also serves another very important purpose its weight counters the pressure of the oil and gas in underground reservoir rocks. 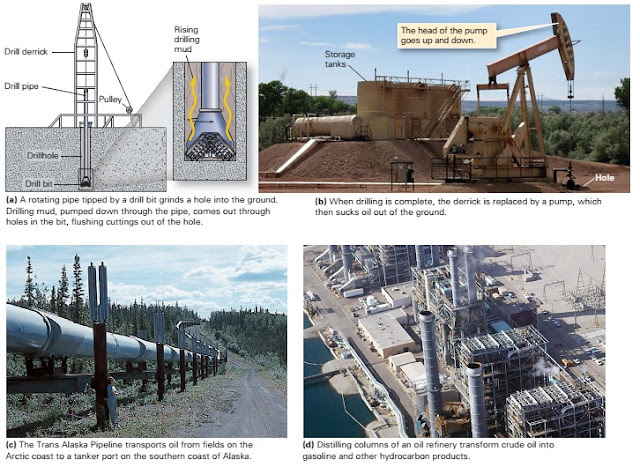 By doing so, it prevents hydrocarbons from entering the hole until drilling has been completed, the hole has been “ﬁnished” (by removing the drill pipe and sealing the walls of the drill hole with concrete), and the hole has been capped. Were it not for the mud, the natural pressure in the reservoir rock would drive oil and/or gas into the hole. And if the pressure were great enough, the hydrocarbons would rush up the hole and spurt out of the ground as a gusher or blowout. Gushers and blowouts can be disastrous, because they spill oil onto the land and, in some cases, ignite into an inferno. Early drilling methods could produce only vertical drill holes. But as technology advanced, drillers developed methods to control the path of the drill bit so the hole can curve and become diagonal or even horizontal. Such directional drilling has become so precise that a driller, using a joystick to steer the bit, and sensors that specify the exact location of the bit in 3-D space, can hit an underground target that is only 15 cm wide from a distance of a few kilometres. Drillers use derricks (towers) to hoist the heavy drill pipe. To drill in an offshore hydrocarbon reserve, one that occurs in strata beneath the continental shelf, the derrick must be constructed on an offshore-drilling facility. These may be built on huge towers rising from the sea ﬂoor, or on giant submerged pontoons. Using directional drilling, it’s possible to reach multiple targets from the same platform. On completion of a hole, workers remove the drilling rig and set up a pump. Some pumps resemble a bird pecking for grain; their heads move up and down to pull up oil that has seeped out of pores in the reservoir rock into the drill hole. You may be surprised to learn that simple pumping gets only about 30% of the oil in a reservoir rock out of the ground. Thus oil companies may use secondary recovery techniques to coax out more oil (as much as 20% more). For example, a company may drive oil toward a drill hole by forcing steam into the ground nearby. The steam heats the oil in the ground, making it less viscous, and pushes it along. In some cases, drillers create artiﬁcial fractures in rock around the hole by pumping a high-pressure mixture of water, various chemicals, and sand into a portion of the hole. This process, called hydrofracturing (or “fracking”) creates new fractures and opens up pre-existing ones. The sand left by the fracturing ﬂuid keeps the cracks from closing tightly, so they remain permeable. The fractures provide easy routes for the oil to follow from the rock to the well. Once extracted directly from the ground, “crude oil” ﬂows ﬁrst into storage tanks and then into a pipeline or tanker, which transports it to a reﬁnery. At a reﬁnery, workers distil crude oil into several separate components by heating it gently in a vertical pipe called a distillation column. Lighter molecules rise to the top of the column, while heavier molecules stay at the bottom. The heat may also “crack” larger molecules to make smaller ones. Chemical factories buy the largest molecules left at the bottom and transform them into plastics. Reserves are not randomly distributed around the Earth. Currently, countries bordering the Persian Gulf contain the world’s largest reserves in 25 supergiant ﬁelds. In fact, this region has almost 60% of the world’s reserves. Reserves are speciﬁed in barrels (bbl); 1 bbl 42 gallons 159 liters. Why is there so much oil in the Middle East? Much of the region that is now the Middle East was situated in tropical areas between latitude 20n south and 20n north between the Jurassic (135 Ma) and the Late Cretaceous (65 Ma). Biological productivity was very high in these tropical regions, so the muds that accumulated there were very organic rich and lithiﬁed to become excellent source rocks. Thick layers of sand buried the source rocks and eventually became porous sandstones that make excellent reservoir rocks. Later, mountain-building processes folded the layers into large anticlines, which are excellent traps. The Middle East is not the only source of oil. Reserves also occur in sedimentary basins formed along passive continental margins, such as the Gulf Coast of the United States and the Atlantic Coasts of Africa and Brazil, as well as in intracratonic and foreland basins within continents.